Although the map says it’s not far from the Unbound coordinating office, it takes nearly two hours to reach the dusty Manchay region outside of Lima, Peru. The community is situated on a steep hill, and when the wind picks up the dust swirls in a fury. It’s a strong name, one that has great meaning to all the women involved. The group is made up of representatives from Unbound mothers groups in the area. It was created to protect children and mothers who were being mistreated, verbally and physically, in their communities. Maya (her name has been changed here for privacy) talks about a friend who came to her for help. This friend’s husband had physically attacked and verbally threatened her. Maya talked to her friend and assured her the police would help. Nestled in steep, dry hills is the Manchay region outside of Lima, Peru. The mothers group, Defenders of the Family, model strength and courage as they stand together in their bright red vests. She said she got involved with the group because she didn’t have formal support when she experienced abuse. She said she was still living with her husband, but that the abusive behavior had stopped. Getting involved with the group, she said, made her confident and fearless. Because of the support she got, she knew her husband would be held accountable if the abuse happened again. The Defenders are advocates for others experiencing abuse in their communities. They listen, protect, observe, and offer support and guidance. They help lead the women to services that can offer additional support — family services, police, safe havens and more. These women in the red vests are strong and passionate about their cause. They are a voice for the voiceless, and they are not afraid to speak out. Across the world, in an island nation prone to typhoons and other natural disasters, a group of men echo the call of the Defenders. In the Philippines, a fathers group known for their work in disaster response formed what they call the Justice Fund. The dads launched the domestic abuse prevention program in April. The idea originated after a dialogue with mothers of sponsored children in the Unbound program. “The purpose [of the initiative] is to support women and children who have been abused,” said Reymand, one of the fathers involved in starting the Justice Fund. The men of the Justice Fund are members of the local ERPAT group, which supports men in their roles as nurturing fathers. ERPAT stands for Empowerment and Reaffirmation of Paternal Abilities. Besides disaster response, the dads have been recognized for their work in coordinating blood drives and other community service. Reymand, a member of the ERPAT fathers who is involved in leading the Justice Fund initiative, with his wife, Solly. The ERPAT fathers in the Philippines are known for their community service. Like the mothers in the Defenders group, the ERPAT fathers hope to be a support for abused women and children by referring them to police, family services, lawyers and therapists. Sometimes financial constraints keep families from accessing services, which is why the fathers are raising funds to assist those who couldn’t otherwise afford to seek help. Melchor, president of the ERPAT group, shared the story of a father whose daughter, a minor, was taken by a man to another community. The father was reluctant to file charges, saying he just wanted to take his daughter home. Promoting values such as respect for others starts with raising children with these beliefs, which is why the dads are reaching out in their own families and communities. They’re organizing forums to discuss topics such as gender equality, child trafficking, and violence against women and children. The initiative has the support of the Unbound program. 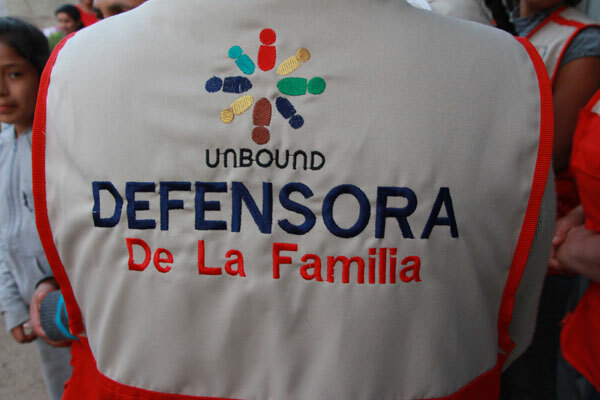 Unbound sponsorship creates stability for families and a supportive environment where their efforts can take shape. Parents in Peru, the Philippines and across the world are taking leadership roles in their communities and working together to protect human dignity and empower others. Stand up for a family and sponsor today.